Gen. George Armstrong Custer’s time in Texas. It’s not hard to figure that Gen. George Armstrong Custer’s time in Texas was controversial and paradoxical. His entire military career was that way, starting when he graduated last in his class at West Point in 1861 until the bitter end at Little Big Horn in 1875. Custer stirred controversy and debate in his own time, and historians have continued the debate to the present day. Brilliant or buffoon? Martyr or imbecile? The debate continues. Distinguished by shoulder-length curly blonde hair, a red tie and sailor’s blouse, he was something of a dandy and something of his own creation. He became to the world the dashing and daring soldier that he imagined himself to be when he was a boy growing up in Ohio. That boyhood dream became a reality in the Civil War when Custer distinguished himself as a daring – some said reckless – commander who led Union troops successfully at Gettysburg and other major battles and pursued Confederate General Robert E. Lee to Appomattox. Lee’s surrender at Appomattox ended the Civil War for most people, though Texas was among the states that didn’t officially surrender until a month later. The entire South, including Texas, was ravaged by anarchy in the immediate aftermath of the war. The U.S. also feared that the Confederates would regroup in Mexico under emperor French emperor Maximillian. Gen Phil Sheridan sent Custer and a thousand or so volunteer troops to Texas in 1866 to help restore and maintain order, but Custer had his hands full maintaining order among his own troops. The conflict arose over Custer’s refusal to let the soldiers pillage and plunder the countryside to their heart’s content. When they arrived at Hempstead in August of 1866, Custer issued orders that made it clear that “foraging” the land and its bounty would not be tolerated. Anyone found guilty of disobeying those orders would have his head shaved and receive 25 lashes of the whip. Once bloody and shorn soldiers started showing up in camp, the foraging stopped. This measure, though successful, was also controversial. 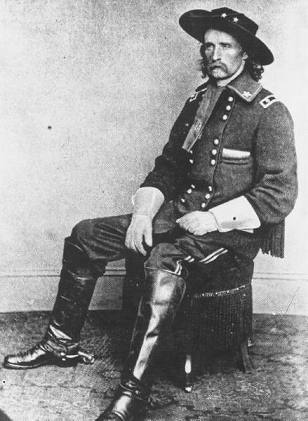 Custer was accused of violating the Reconstruction Laws that “no cruel or unjust punishment” be inflicted on “disturbers of the public peace and criminals.” Custer argued that the punishment was neither cruel nor unjust and, besides, it worked, which allowed him to follow his own orders in regard to protecting Texas planters and farmers from the troops. Custer’s peculiar disciplinary measures alienated many of his troops (and some authorities in Washington) but not the people who Texas, who would generally recall Custer fondly, mainly because he had protected them from those who would have preyed upon the land and the people who lived on it and from it. The ban on foraging was particularly galling to the soldiers as they marched into Texas with a lot or orders and drills but few rations. Custer assured them that rations would be available at Hempstead, but that turned out to be not true. The troops spent two unhappy months there, and then marched to Austin. The Custers moved into the old Blind Asylum building on the outskirts of town, now restored and a part of the University of Texas campus. For Custer’s wife, Libbie, who wrote about her experiences in Texas in her book “Tenting on the Plains,” the stay in Austin was an idyllic time, coming as it did between the Civil War and the Indian Wars on the Plains. They spent a lot of time horseback riding and at the race track. Custer liked a little place on Shoal Creek so much that he had a makeshift jail built there. “Armstrong was having the time of his life, even while performing the unpleasant and unrewarding task of taming Texas,” one biographer wrote. For her part, Libbie enjoyed the luxuries of a bathtub, furniture, a fireplace and a social life. It was nice while it lasted. He was mustered out of the volunteers in February of 1867, and would eventually take command of the Seventh Cavalry, where he would meet his fate and seal his name in the history books at Little Big Horn. The Texas legislature passed a resolution of condolence, noting that Custer had endeared himself to the people of Texas during his brief stay.